After an apocalyptic alien attack on Earth, an ion storm hits the planet. A small team of male and female commandos takes shelter in an abandoned research facility. However, something worse than the aliens awaits them in there. A group of survivors try to avoid the battles of World War III; when they try to escape to the quiet lands, they encounter something much more deadly. After an accident cause him to lose his sight, Aaron Scates finds himself in a fight for survival. He must learn to embrace his inner animal or become another failed experiment. Enter this base at your on risk. Earth is in a post-apocalyptic state and five military survivors looking for shelter before an ion storm hits. Come across a drifter who informs them of a scientific base that he's heading to and they decide to follow. When they get there, it's abandoned. While it looks empty, they soon realise why. As they come across a messed up dead corpse and find out this is the home of a genetic alien hybrid. Yes, what incompetent schlock. 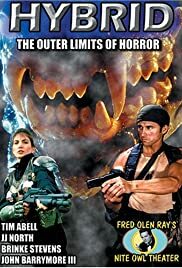 I got some good wink-eye through Fred Olen Ray's poor man's version of "Alien" crossed with "Creepozoids" and a dash of "Shadowzone". Damn "Hybrid" will put you to sleep with its drawn-out story, blunt performances and systematic actions. While, it's basic stuff, there's nothing much to really compensate for its lack of refreshing ideas. There's no can of worms popping up here. Although there are a few unusual sequences that creep in and those moments do have your full attention. Like just what hell was going on in the opening minutes? It was re-used stock footage to confusingly explain why Earth looked like apocalyptic wasteland. An out-of-nowhere shower scene involving the voluptuous J.J. North and the always dashing Brinke Stevens, decide to spice up the outing by making sure that they are thoroughly cleaned for the messy onslaught that waits and then you get the horny alien hybrid getting its groove on with one of its victims. Since the rehashed story loses track for most part with its plodding nature, serious outlook and an unconvincingly brittle (and really heartfelt) back-story to build these characters. These tiny spoonfuls are certainly ludicrous, but at least they were diverting enough to catch your eye. As really this could have been more fun, if they decided to boost up the energy levels. The rest of it didn't cut it at all. Your ears on the other hand, don't cope any slack at all from this lame script with its heavy use of wit and snappy wisecracks. I found most of it pitiful and state the bloody obvious with awful delivery. Suspense is non-exist in this pressure filled situation, the flat violence is weakly staged with its timidly unoriginal blood splatter, and most of the characters are an aggravatingly leaden bunch who do too many dumb things when there's an alien about. Wait to you see the horridly shonky alien design. The costume is like something someone would wear at a theme park, so not to scare the little kids. Somewhere cross between H. R. Giger's "Alien" design and a miniature Godzilla. Even the camera shots (lot of POV shots) steal heavily from "Alien", where it likes to focus on the creature's nasty looking mouth and gooey slime it leaves about. It looks too goofy and showing it in its full glory for the majority of the time doesn't help. Everything feels and looks plastic, not just the sets, everything. This independent straight-to-video farce might go out with a bang, but for most part you might be battling yourself to last the distance.